Aegina - Αίγινα, lying some 17 nm south-west of Piraeus, is a hilly and fertile island of Tertiary limestones and schists, with isolated rounded hills of volcanic origin. 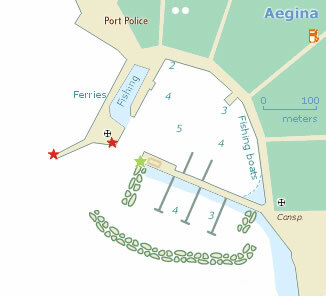 For the most part the coast falls steeply down to the sea, with few sheltered bays. The main occupation of the inhabitants is farming, in particular the growing and export of the island’s excellent pistachio nuts. Fishing, sponge-diving and pottery manufacture are also of some economic importance. 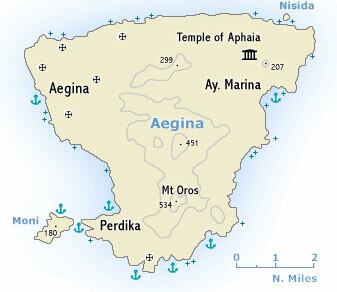 Aegina is noted for the production of its water-coolers (kannatia) – two-handled wide-necked jars in a porous fabric which keep their contents cool by evaporation. 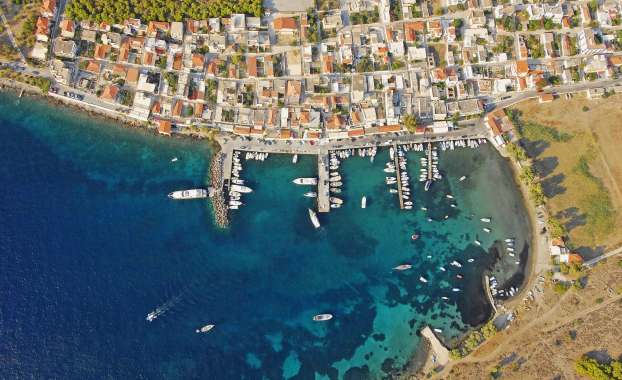 With its mild climate and low rainfall, Aegina has long been favoured as a summer resort by the prosperous citizens of Athens. In recent years it has become increasingly popular with foreign visitors. At the beginning of the Persian Wars this seafaring State was at the height of its power. After the Battle of Salamis, in which 30 vessels of Aegina took part, an Aeginetan ship was awarded the prize for the highest valour. But Aegina was also led by its commercial interests to offer Darius’ envoys earth and water in token of submission, whereupon, on the motion of Athens, it was called to account by Sparta. This was the occasion of further conflicts with Athens, which saw the strong neighbouring island as an obstacle to the expansion of its sea-power. After naval victories at Angistri and off Aegina itself the Athenians – though simultaneously fighting with Megara and in Egypt – forced Aegina to submit after a nine-month-long siege, and in 456 BCE the city was compelled to pull down its walls, surrender its warships and pay tribute to Athens. At the beginning of the Peloponnesian War (431 BCE) the Aeginetans were expelled from their island and the land distributed to citizens of Attica. After the final defeat of Athens in 404 BCE many of them returned, but the island’s great days were over. Athens rapidly recovered and after a series of military campaigns regained control of Aegina, which thereafter shared the fortunes of the Athenian State. 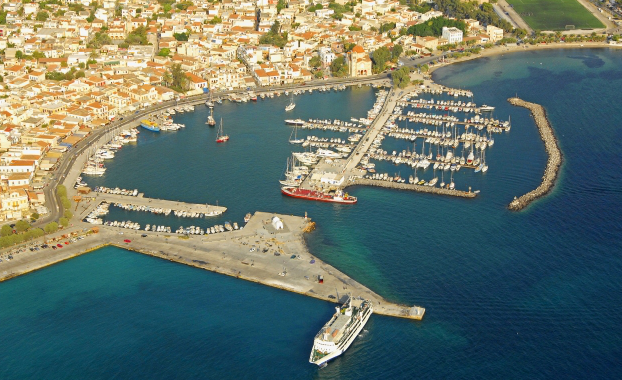 ↑ Aegina marina – aerial photo looking east.